This application protocol describes use of the Treg	Expansion	Kit,	human,	which is	designed	to	efficiently	expand	Treg	cells	that maintain FoxP3	expression	after	isolation	with	the	CD4+CD25+ Regulatory	T	Cell	Isolation	Kit,	human. It includes	a	complete	protocol	for	your	Treg	cell	workflow,	describing human	Treg	cell	isolation	from	peripheral	blood	mononuclear	cells	(PBMCs),	their in	vitro expansion, and	subsequent	flow	cytometry	analysis. Always	prepare	reagents	freshly	on	the	same	day	that intracellular	FoxP3	staining	is performed. The	required	total	buffer	volumes	should	be	calculated	beforehand;	volumes	will	depend	on the	number	of	cells	to	be	analyzed	as	well	as	the	number	of	tests	to	be	performed. For	1	sample	with	1×106 Treg	cells: prepare	1	mL	of	fixation/permeabilization	solution	and	4	mL	of	1× Permeabilization	Buffer. Fixation/Permeabilization	Solution	2	(e.g., 0.75	mL). distilled	water	(e.g., 9	mL). The	expansion	medium	can	be	stored	for	up	to	10	days	under	sterile	conditions	at	4 °C. ▲ Note: Rapamycin	has	been	shown	to	increase	the frequency	of	FoxP3+ Treg cells during expansion (Battaglia,	M.	et	al. (2005)	Blood	105: 4743–4748). by	density	gradient	centrifugation,	for	example,	using	Ficoll-Paque™	according	to	the	manufacturer’s	instructions. Collect	a	sample	of	PBMCs	for	subsequent	flow	cytometry analysis. See "Treg cell staining and flow cytometry analysis". All steps described below for the magnetic labeling and depletion of non-CD4+ cells, as well as the labeling and selection of CD25+ cells, are performed using the CD4+CD25+ Regulatory T Cell Isolation Kit, human. Volumes	for	magnetic	labeling	given	below	are	for	up	to	1×10⁷	total	cells. When	working	with fewer	than	1×10⁷	cells,	use	the	same	volumes	as	indicated. When	working	with	higher	cell	numbers,	scale	up	all	reagent	volumes	and	total	volumes	accordingly	(e.g. for	2×10⁷	total	cells,	use	twice	the	volume	of	all	indicated	reagent	volumes	and	total	volumes). Centrifuge	cell	suspension	at	300×g	for	10	minutes. Discard	supernatant. Resuspend	cell	pellet	in	90 μL	of	separation	buffer	per	1×10⁷	total	cells. Add	10	μL	of	CD4+ T	Cell	Biotin-Antibody Cocktail per	1×10⁷	total	cells. Mix	well	and	incubate	for	5	minutes	in	the	refrigerator	(2–8	°C). Add	20	μL	of	Anti-Biotin	MicroBeads	per 1×10⁷	total	cells. Mix	well	and	incubate	for	10	minutes	in	the	refrigerator (2–8	°C). Adjust	the	volume	to	a	minimum	of	500	μL	of	separation	buffer. ▲ Note:	Resuspend	up	to	1×10⁸	cells	in	500	μL	of	separation	buffer. For	higher	cell	numbers,	scale	up	buffer	volume	accordingly. The	first	step	of	Treg	cell	isolation	is	a	depletion	of	non-CD4+ cells. Here,	an	LD	Column	is	used, which	has	a	capacity	of	1×108 labeled	cells	and	5×108 total	cells. When	using	the	CD4+CD25+ Regulatory	T	cell	Isolation	Kit,	human,	we do	not	recommend	to process	more	than	1.3×108 total	cells	on	an	LD	Column. When	exceeding	this	cell	number,	it	is	strongly	recommended to	split	the	sample	and	use	additional	LD	Columns. Place	LD	Column(s)	in	the	magnetic	field	of	a	MidiMACS™	Separator. Prepare	column	by	rinsing	with	2	mL	of	separation	buffer. Always	wait	until	the	column	reservoir	is	empty	before	proceeding to	the	next	step. Apply	cell	suspension	onto	the	column. Collect	unlabeled	cells	that	pass	through	and	wash	column twice	with	1	mL	of	separation	buffer each. Collect	total	effluent;	this	is	the	unlabeled	pre-enriched	CD4+ cell	fraction which	is	needed	for	further	Treg	cell	isolation. Volumes	for	magnetic	labeling	given	below	are	for	an	initial starting	cell	number	of	up	to	1×10⁷	total	cells. For	higher	initial	cell numbers,	scale	up	all	volumes	accordingly. Resuspend	cell	pellet	in	90	μL	of	separation	buffer per	1×10⁷	total	cells. Add	10	μL	of	CD25	MicroBeads	II	per	1×10⁷	total	cells. Mix	well	and	incubate	for	15	minutes	in	the	refrigerator (2–8	°C). Wash	cells	by	adding	1–2	mL	of	separation	buffer and	centrifuge	at	300×g for	10	minutes. Discard	supernatant. Resuspend	up	to	1×10⁸	cells	in	500	μL	of separation	buffer. ▲ Note: For	higher	cell	numbers,	scale	up	buffer	volume	accordingly. The	second	step	during	Treg	cell	isolation	is	a	positive	selection	of	CD25+ cells. Here,	two consecutive	MS	Columns	are	used,	with	a	capacity	of	1×10⁷ labeled	cells. To	not	exceed	the capacity,	it	is	recommended	to	determine	the	frequency	of	CD25+ cells	in	your	cell	suspension	by	flow	cytometry beforehand. Place	an	MS	Column	in	the	magnetic	field	of	a	MiniMACS™	Separator. Prepare	column	by	rinsing	with	500	μL	of	separation	buffer. Apply	cell	suspension	onto	the	column. Collect	flow-through containing	unlabeled	cells. Wash	column	3 times	with	500	μL	of	separation	buffer	each. Collect	unlabeled	cells that	pass	through	and	combine	with	the	effluent	from	step	3. Remove	column	from	the	separator	and	place	it	on	a	suitable collection	tube. Pipette	1	mL	of	separation	buffer onto	the	column. Immediately	flush	out	magnetically	labeled	cells	by	firmly	pushing	the	plunger into	the	column. To	increase	purity	of	CD4+CD25+ cells,	the	eluted	fraction	can	be	enriched	over	a	second	MS	Column (recommended). Repeat	the magnetic	separation	procedure	described	in	steps	1	to	6	using a	new	MS	Column. The	isolated	Treg	cells	are	now ready to use for in	vitro expansion. Collect	a	sample	of	isolated	CD4+CD25+ cells for	subsequent	flow	cytometry analysis. See "Staining of Treg cells and flow cytometry analysis". b) The	initial	cell	number	and	frequency	of	FoxP3+CD4+ cells. Volumes	given	below	are	for	up	to	1×10⁶ nucleated	cells. When working	with	fewer	than 1×10⁶	cells,	use	the	same	volumes	as	indicated except	for	the	fixation	step due	to	the	impact	on	cell	morphology. When	working	with higher	cell	numbers,	scale	up	all	reagent volumes	and	total	volumes,	accordingly	(e.g., for	2×10⁶	nucleated cells,	use	twice	the	volume	of	all	indicated	reagent	volumes	and total	volumes). The Treg	Detection	Kit	(CD4/CD25/FoxP3)	(PE),	human, or the Treg	Detection	Kit	(CD4/CD25/FoxP3)	(APC),	human, include all the necessary reagents for the following steps. Resuspend	up	to	1×10⁶	nucleated	cells	per	90	μL	of	separation	buffer. Add	10	μL	of	CD4-FITC	and	20	μL	of	CD25	antibody (either	PE	or	APC	conjugated). Mix	well	and	incubate	for	10	minutes	in	the	dark	in	the	refrigerator (2–8	°C). Wash	cells	by	adding	1–2	mL	of	separation	buffer per	1×10⁶	cells	and centrifuge	at	300×g	for	5	minutes	at	4	°C. Discard	supernatant. Proceed	immediately	to	"Intracellular staining with the Anti-FoxP3 antibody". Resuspend	1×10⁶	nucleated	cells	in 1	mL cold,	freshly	prepared fixation/permeabilization	solution (for	details	refer	to	"Things to prepare in advance"). When	working	with	fewer cells,	scale	down	the	buffer	volume	accordingly	(e.g. for	5×10⁵	nucleated cells	use	500	µL	of fixation/permeabilization	solution). Mix	well	and	incubate	for	30	minutes	in	the	dark	in	the	refrigerator (2–8	°C). Wash	cells	by	adding	1–2	mL	of	cold	separation	buffer	per	1×10⁶	cells	and centrifuge	at	300×g	for	5	minutes	at	4	°C. Discard	supernatant. Wash	cells	by	adding	1–2	mL	of	cold	1× Permeabilization	Buffer	(for	details	refer	to	"Things to prepare in advance") per	1×10⁶	cells	and	centrifuge	at	300×g	for	5	minutes	at	4	°C. Discard	supernatant. Resuspend	up	to	1×10⁶	nucleated	cells	in	80	μL	of	cold 1×	Permeabilization	Buffer. Add	20	μL	of	FcR	Blocking	Reagent. Add	10	μL	of	the	Anti-FoxP3	antibody (either	APC	or	PE conjugated). Wash	cells	by	adding	1–2	mL	of	cold	1×	Permeabilization Buffer per	1×10⁶	cells	and	centrifuge	at	300×g	for	5	minutes	at 4	°C. Discard	supernatant. Resuspend cell	pellet	in	a	suitable	amount	of	separation	buffer	for	analysis by	flow	cytometry. ▲ Note:	Due	to	fixation	and	permeabilization,	cells	can	be	smaller	than	viable	cells. Thus,	FSC/SSC	settings	of	the	flow	cytometer	might	need	to be	adjusted. To	assess the	purity	of	the	isolated	Treg	cells	and	the	initial	frequency of	FoxP3+	CD4+ cells, the	cells	are	analyzed	by	flow	cytometry. The	analysis	should	be	performed	with	the	cell	sample	taken	in "Isolation of PBMCs" and	the cell	sample	taken in "Magnetic separation of CD25+ cells". Identify lymphocytes	by	FSC/SSC	gating. Exclude dead	cells	from	the	analysis	by	using	the live/dead	cell	exclusion	marker	PI. Analyze lymphocytes	further for	their	expression	of	CD4	(y-axis)	and	CD25	(x-axis)	to	assess	the	purity	of	CD4+CD25+ Treg	cells	(See figure below,	1	A	and	B, left	plots). 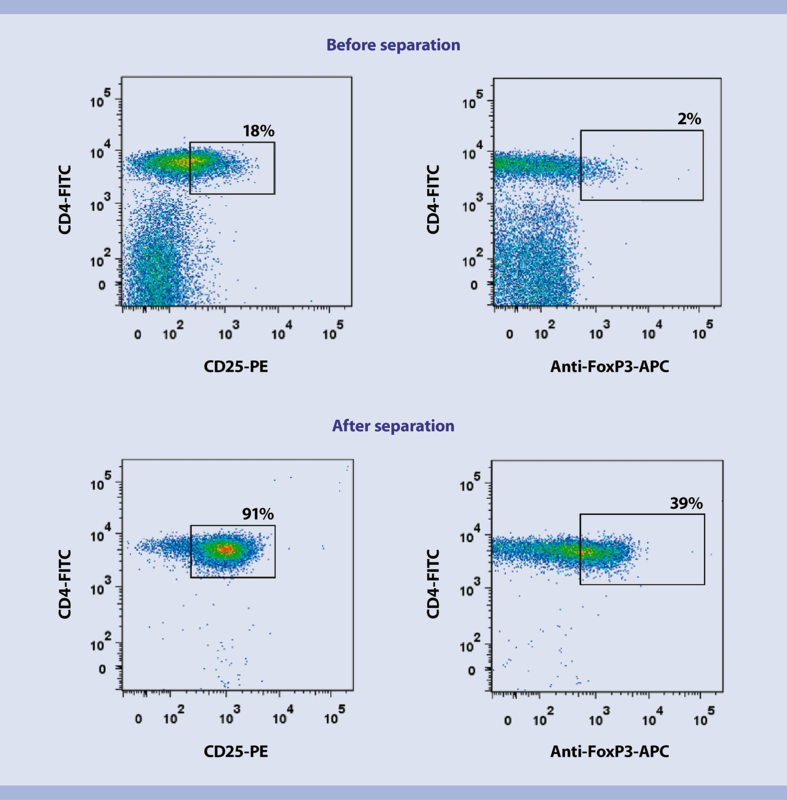 assess	the	initial	frequency	of	FoxP3-expressing CD4+ cells	among	lymphocytes	(See figure below,	A	and	B, right	plots). Flow cytometry of Treg cells. CD4+CD25+ regulatory	T	cells	were	isolated	from	human	PBMCs	using	the	CD4+CD25+ Regulatory	T	Cell	Isolation	Kit,	human. The	cells	were	fluorescently	stained	with	CD4-FITC,	CD25-PE	and	Anti-FoxP3-APC	before	(A)	and	after	(B)	separation. CD4+CD25+ regulatory	T	cells	were	isolated	from	human	PBMCs	by	using	the	CD4+CD25+ Regulatory	T	Cell	Isolation	Kit,	human. The	cells	were	fluorescently	stained	with	CD4-FITC,	CD25-PE	and	Anti-FoxP3-APC	before	(A)	and	after	(B)	separation. Prepare	the	expansion	medium	as	described	in "Things to prepare in advance”. The	Treg	Expansion	Kit	is	based	on	MACSiBead™ Particles	preloaded with	CD3	and	CD28	antibodies. Best	expansion	of	Treg cells	is accomplished	by	using MACSiBead Particles	and	Treg cells	at	a	bead-to-cell	ratio	of	4:1. Determine	the	total	number	of	Treg	cells. Wash	Treg	cells	by	adding 5–10	volumes	expansion medium	to	the	cells	and centrifuge at	300×g	for	10	minutes. Discard	supernatant. Resuspend	cells	at	a	concentration	of	1×10⁶	cells/mL	in expansion	medium. Pipet 100	μL (1x105 Treg	cells)	in	each well	of	a	96-well, round-bottom	plate. The	CD3/CD28	MACSiBead Particles have	a	concentration	of	2×10⁷	beads/mL and	should	be	used	at	a	bead-to-cell	ratio	of	4:1. MACSiBead	Particles	are	bigger	in	size	than	MACS®	MicroBeads and	sediment	rapidly. It	is	therefore	mandatory	to	bring	the	MACSiBead Particles	into	suspension	by	vortexing	prior	to	use. Resuspend	CD3/CD28	MACSiBead Particles	thoroughly by	vortexing and transfer	4	times	the	amount	of	Treg	cells	to a	suitable	tube (e.g.,	for	expansion	of	1×106	Treg	cells,	transfer	4×106 or 200 µL of	MACSiBead Particles). Wash	MACSiBead Particles by	adding 300–600	μL	of	culture	medium	and	centrifuge	at	300×g for	5	minutes. Aspirate	supernatant	completely. Resuspend	CD3/CD28	MACSiBead Particles	in expansion medium to	get	a	final	concentration	of	2×10⁷	beads/mL (e.g.,	when 4×106 of	MACSiBead Particles	are	used,	resuspend in	200	µL of	expansion	medium). Add	20	μL	of	CD3/CD28	MACSiBead Particles	to	each	well	containing	the	Treg	cells. As	the	MACSiBead Particles sediment	rapidly,	the	bead	suspension	should	be	vortexed	from	time	to	time before adding to	the	well. The	final	volume	of	each	well	is	now	120	µL. Let the	coculture	of	Treg	cells	and	MACSiBead Particles	rest	for	1	day	at	37 °C	and	5–7 %	CO2. Day	1:	Add	100 µL of	expansion	medium	to	each	well. Day	3–5 (depending	on	medium	color): Either	split	Treg	cells	(including	MACSiBead Particles)	at	a	ratio	of	1:2	and	resuspend	cells	in	200	µL of	fresh	expansion	medium	or carefully	aspirate	100 µL of	old	medium	and	add	100 µL of	fresh	expansion	medium. Day	5–8: Either	transfer	Treg	cells	(including	MACSiBead Particles)	to	a	24-well	plate	in	higher	volumes,	e.g., 5×10⁵	Treg	cells	in	500	µL, or	split	Treg	cells	(including	MACSiBead Particles)	at	a	ratio	of	1:2	and	resuspend	cells	in	200	µL of	fresh	expansion	medium. Day	14: The	Treg expansion	process	can	be	stopped	here	or	followed by	restimulation	of	Treg	cells. If	you	want	to	stop	Treg	expansion	here,	determine	the	total	cell	number	and	the	frequency	of	CD4+FoxP3+ cells	by	performing	a	surface	and	intracellular	flow	cytometry	staining to	assess	the	result	of	expansion. For	details	refer	to "Flow cytometry analysis". If	you	want	to	proceed	with	restimulation, the	CD3/CD28	MACSiBead Particles	may	be	removed	prior to restimulation. For	details	refer to	"Restimulation of Treg cells". Removal	of	MACSiBead™ Particles used for cell expansion may	be	required	before	restimulation	with MACSiBead Particles. In	addition,	bead	removal	is	required	before	magnetic	separation	of	cells	with	MACS® MicroBeads	or before	stimulation	with	different	agents	or	antigens. Harvest	cells, transfer	to	an	appropriate	tube	and	wash	once	with	separation	buffer. Determine	cell	number	and	resuspend	cells	in	separation	buffer at	a	density	of	up	to	2×107 cells/mL	and	vortex	thoroughly. instructions	on	how	to	use	the	MACSiMAG Separator	can	be	found in	the	MACSiMAG Separator	data sheet. Retaining	the	tube	in	the	magnet,	carefully	remove	the	supernatant	containing	the	MACSiBead Particles-depleted	cells	and	place	in	a	new	tube. Vortex	sample,	replace	tube	in	the	MACSiMAG Separator, and	repeat	steps	4–5. Collected	cells	can	now	be	further	processed	as	required,	e.g., for	restimulation	with	MACSiBead Particles. The	MACSiMAG	Separator. (A)	MACSiMAG	Separator	with	tube	rack	positioned	for	tubes	of	5	mL	or	.5	mL	in	size. (B)	MACSiMAG	Separator	with	tube	rack	positioned	for	tubes	of	1.5	mL	or	5	mL	in	size. (C)	MACSiMAG	Separator	with	15	mL	and	50	mL	tube. (A)	MACSiMAG™ Separator	with	tube	rack	positioned	for	tubes	of	5	mL	or	.5	mL	in	size. (B)	MACSiMAG™ Separator	with	tube	rack	positioned	for	tubes	of	1.5	mL	or	5	mL	in	size. (C)	MACSiMAG™ Separator	with	15	mL	and	50	mL	tube. Restimulation	is	performed	with	a	bead-to-cell	ratio	of	4:1. Depending	on	Treg	number	and	resulting	volumes,	the	restimulation can	be	performed	in either a	96-well	plate	or	in	a	24-well	plate. If	you	prefer	to	restimulate Treg	cells	in	a 96-well plate, see "in vitro expansion of Treg cells" and	follow	the	protocol. Alternatively,	restimulation	in	24-well	plates	is done in larger volumes,	for	example,	5×10⁵	Treg	cells	in	500 μL	of	expansion	medium	and	100	μL	of	CD3/CD28	MACSiBead Particles (=	2×106 particles). Day	15:	Add	100 µL of	expansion	medium	per well	when	restimulation	is	performed	in	a	96-well	plate, or	500 µL of	expansion medium	per well	when	restimulation is	performed	in	a	24-well	plate. Day	17–19 (depending	on	medium	color): Either	split Treg	cells	again	(including	the	MACSiBead Particles)	at	a	ratio	of	1:2	and	fill	the	well	to	1 mL	with	fresh	expansion medium	or	carefully aspirate	500 µL old	medium	and	add	500 µL fresh	expansion	medium. Day	21: The	Treg	expansion	process	should	be	stopped	after	21	days. To	assess	the	result	of	expansion,	determine	the	total	cell	number	and	the	frequency	of	FoxP3-expressing	cells,	by	performing	a	surface	and	intracellular	flow	cytometry	staining. For	details	see "Treg cell staining and flow cytometry analysis". ▲ Note:	Bead	removal	is	required	before	certain	downstream	applications,	i.e.,	magnetic	separation	of	cells	with	MACS MicroBeads	or	before	stimulation	with	different	agents	or	antigens. For	details	refer	to	"Removal of MACSiBead Particles". To	determine	the	frequency of CD4+FoxP3+ cells	after	expansion,	the	cells	are analyzed	by	flow	cytometry. Identify lymphocytes	according	to	FSC	and	SSC. Exclude dead	cells from	the	analysis	by	using	the live/dead	cell	exclusion	marker	PI. Analyze lymphocytes	further	for	their	expression	of	CD4	(y-axis)	and	FoxP3	(x-axis)	to	assess	the	frequency	of CD4+FoxP3+ cells	among	lymphocytes	(see figure below). ▲ Note: CD4	should be	used	here	to	identify	Treg	cells	as	CD25	is	not	an	appropriate	Treg	marker	after	expansion	as	it	might also	be	upregulated	on	activated	T	cells. Analysis	of	Treg	expansion. CD4+CD25+ regulatory	T	cells	were	isolated	from	human	PBMCs	by	using	the	CD4+CD25+ Regulatory	T	Cell	Isolation	Kit,	human	and	expanded	for	21	days	with	the	Treg	Expansion	Kit. Afterwards,	the	cells	were	fluorescently	stained	with	CD4-FITC and	FoxP3-APC	antibodies. (A) Representative flow cytometry plot	of	expanded	Treg	cells	and	(B)	frequency	of	FoxP3+ Treg	cells	among	CD4+ cells	after	expansion	from	two experiments. (C)	Fold-expansion	of	total	cells	(left)	and	FoxP3+	cells	(right)	(Fold-expansion	comparing	the	initial	and	the	final	cell	number). Each	dot	represents	one	experiment. CD4+ CD25+ regulatory	T	cells	were	isolated	from	human	PBMCs	by	using	the	CD4+ CD25+ Regulatory	T	Cell	Isolation	Kit,	human	and	expanded	for	21	days	with	the	Treg	Expansion	Kit. Afterwards,	the	cells	were	fluorescently	stained	with	CD4-FITC and	FoxP3-APC	antibodies. (A)	Representative flow cytometry plot	of	expanded	Treg	cells	and	(B)	frequency	of	FoxP3+ Treg	cells	among	CD4+ cells	after	expansion	from	two experiments. (C)	Fold-expansion	of	total	cells	(left)	and	FoxP3+	cells	(right)	(Fold-expansion	comparing	the	initial	and	the	final	cell	number). Each	dot	represents	one	experiment.